Presented by the Office of the Governor and in partnership with the U.S. Mexico Chamber of Commerce and the Greater Houston Partnership, the Small Business Forum features private and public resources, practical solutions, best practices and expert assistance on a broad range of business topics and challenges. The Forum celebrates Hispanic Business Owners. The event aims to provide small business owners and aspiring entrepreneurs with timely, relevant, actionable advice on how to start, grow and sustain their businesses. 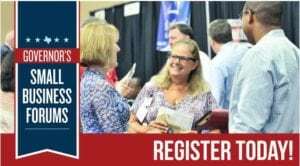 This Small Business Form is also an opportunity to network with other entrepreneurs, business owners, managers, and business-oriented non-profits, as well as local, state and federal agencies.